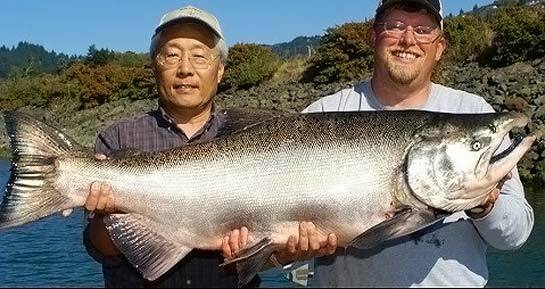 CHETCO RIVER, Ore.—The first 50-pound king of the season was caught trolling the estuary, along with a 47 pounder and a number of 40 pounders, according to guide Andy Martin of Wild Rivers Fishing. The main river doesn't open until Nov. 5. Expect the kings to pour into the main river regardless of the date, you just can't fish for them in the main river until Nov. 5. Fishing Report Redding.com October 28, 2010. Chetco River 47-pound chinook salmon. Supporters of stronger protection for the National Wild and Scenic Chetco were significantly in the majority at the October 26 Forest Service/BLM hearing in Brookings, Oregon. Of the 40 speakers, 35 testified in favor of the Forest Service's proposal to withdraw ~ 17 miles of the Wild and Scenic River from mineral entry and location under the 1872 Mining Law for five years. Forest Service and BLM officials hold a public meeting in Brookings, Oregon on the proposed temporary mineral withdrawal for the National Wild and Scenic Chetco River. 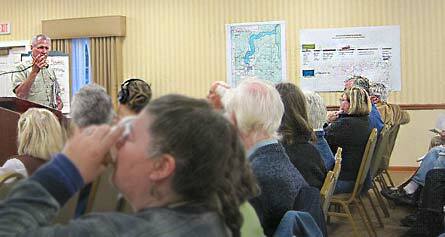 Local residents strongly supported banning future mining along the Chetco River during a forum Wednesday afternoon at the Best Western Inn. 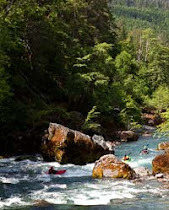 There are may reasons why the Wild and Scenic Chetco River should be protected from gold mining and withdrawn from mineral entry and location under the 1872 Mining Law. One particularly relevant for small businesses in Curry County is that protecting the river also protects a major economic engine for the area. Brookings/Harbor at the mouth of the Chetco River during the 2009 Salmon Derby (Barbara Ullian Photo). The travel expenditures associated with freshwater fishing in the county were estimated at $5.1 million for the year 2008. Local recreation expenditures associated with freshwater fishing were an estimated $673,000. Saltwater fishing provides additional significant economic benefits in Curry County. Hardrock mining, on the other hand, contributes little or nothing to the local economy and is unlikely to ever do so. Updated on October 20, 2011 — On August 1, 2011, the Bureau of Land Management published a notice in the Federal Register that segregates (a temporary withdrawal) approximately 17 miles of the National Wild and Scenic Chetco River from location and entry under the Mining Laws of the United States. See Forest Service map of proposed withdrawal area and the Forest Service's Press Release explaining the withdrawal and announcing the time and place of the Wednesday, October 26th public meeting in Brookings. Learn what you can do to help before November 15th. The two year segregation period provides opportunity for the public to comment on the Forest Service's proposal to withdraw the 5,610 acres—the Wild and Scenic corridor of the river from Boulder Creek downstream to the Forest Boundary—for a period of five years. The purpose of the withdrawal is to provide congress with time to consider legislation to provide greater protection for this world-class salmon and steelhead river. The withdrawal applies only to National Forest lands and does not affect private land in the corridor. Brookings, Oregon – Community members are invited to join the Chetco River Watershed Council on October 22, 2011 for a Chetco River fall clean-up. Cleanup will start at Loeb State Park at 9 A.M. Lots of help is needed to make the cleanup a success. For more information contact: Stan Easley 541 661-1820 or Karen Munson 541 469-1043. The Chetco River Watershed Council is working to preserve and enhance the Chetco River's watershed. Kalmiopsis leachiana was in bloom. This June 15th, volunteers maintained 7 more miles of the Trans Kalmiopsis Wilderness Trail between the Vulcan Lake Trailhead and Box Canyon Camp. The Siskiyou Mountain Club crew put in 790 grueling hours of work to make the trail passable. 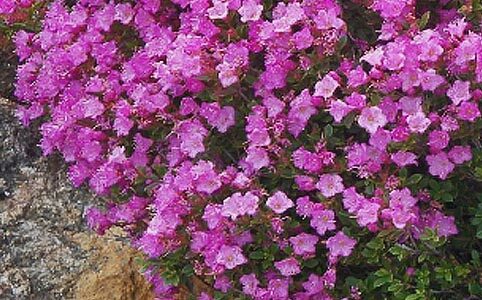 Read about their amazing work and their update of the Trans Kalmiopsis Trail project at the Club's website. Slade Sapora grew up exploring the tide pools of southwest Oregon's Wild Rivers Coast and swimming in the Chetco River. He says he's "fascinated by the natural world we are a part of and passionate about the scientific understanding of it’s endless complexities." At 36 Sapora may be the first person to have charted the entire length of this rugged, beautiful little Wild and Scenic River—from the Chetco's headwaters in the Kalmiopsis Wilderness to the Pacific Ocean at Brookings/Harbor. On June 15, 2011, four intrepid river runners went looking for a wild river in the heart of one of the wildest wilderness areas in the West. They went knowing a Forest Service gate would add five miles (all up hill) to what was going to be an arduous trek anyway. It's all uphill from the Wild and Scenic Illinois River to Chetco Pass the watershed divide of the two wild rivers. Google Earth Image. 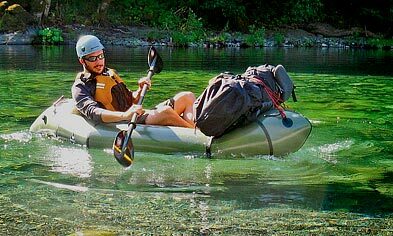 On the banks of the National Wild and Scenic Illinois River, they strapped their supplies, camera gear and boats on their backs and went looking for the Chetco, a little known, seldom run river. Three local long-time wild river runners made a unique journey on the Chetco this July. Tim Palmer, Ann Vileisis and Alan Wilson spent two days going upstream from the Tolman Ranch put-in. Their goal? 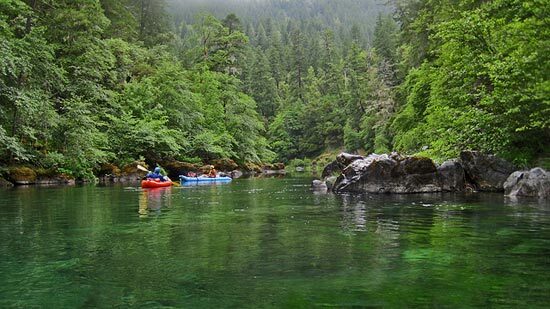 To see for themselves the two mile segment of the Wild and Scenic River that would be reclassified—from Scenic to Wild—under the Chetco River Protect Act. The upgrade in river classification of the reach between Boulder and Mislatnah Creek was recommended by the Siskiyou National Forest in the 1993 Chetco Wild and Scenic River Management Plan. Their downstream float continued past their put-in to what's known as the Steel Bridge. While designated as Scenic, and not recommended by the agency to be re-classified, it also meets the criteria of a Wild River Area.